The Master of Liesborn was an anonymous painter from Germany. The Annunciation, where the angel Gabriel comes to the Virgin Mary and tells her she will bear God a son, was a favorite topic for Medieval and Renaissance artists. It’s celebrated in the Christian calendar on March 25th. In this version, we see Mary reading when Gabriel arrives to bring her the news. This scene comes from the Liesborn altarpiece. Cosimo Tura (1430-1495) also known as Il Cosmè, was a painter of the Quattrocento and the School of Ferrara. He was commissioned for many pieces by the noble d’Este family. In this version of the Annunciation, the Virgin Mary is startled from her reading by the archangel Gabriel. What captivated me about this was that not only was the Virgin Mary depicted with a book but Sir John Donne’s (1420-1503) wife, Lady Donne is also reading. Memling (1430-1494) was a German painter who is well known for his beautiful Early Netherlandish art. He was an expert in devotional art and extremely popular in Italy. He was often commissioned by noble families like the Sforza and Medici, as well as prominent Church officials, for religious pieces. Clare of Rimini (1282-February 10, 1346) was born Chiara Agolanti. She entered the Third Order of Saint Francis and then later on, the Poor Clares. She was beatified in 1782 by Pope Pius VI (December 25, 1717 – August 29, 1799). Her feast day is February 10th. In this painting, Clare is handed a book by Saint John the Evangelist inscribed with Christ’s words: My peace I give you. My peace I leave you. This painting of Mary Magdalen reading comes from a larger altarpiece. Rogier Van der Weyden (1399-June 18, 1464) was one of the most prominent Early Netherlandish painters of this period. He was commissioned by Kings and nobles to create triptychs and devotional art. He was known for his deft use of color, naturalism and sympathetic looking subjects. This piece was commissioned by Balbiani’s husband, René de Birague (February 2, 1506-November 24, 1583), Chancellor of France. Birague, was actually Biragro, from Milan. After the Battle of Pavia, he escaped the wrath of Francesco Sforza, Duke of Milan (July 23, 1401 – March 8, 1466), who had Birague declared a traitor, by fleeing to France with his brothers. There, he married Valentine Balbiani and had 2 children. After her death in 1572, he had this beautiful monument made of her reading with her little dog. Germain Pilon (1537-1590) was a French Renaissance sculptor who also made Birague’s funeral effigy in 1583. Pilon was also the favourite sculptor of Queen Catherine de’ Medici (April 13, 1519-January 5, 1589). This image is one of my favorites, it reminds me of reading with my dog beside me… except of course, in much more comfortable clothing. Saint Catherine is heavily represented at the National Gallery. She was a favorite subject of many painters during the Middle Ages and Renaissance. Although traditionally portrayed with a large wheel, the wheel in this painting is small and shown at the bottom of her cloak (on her right), with a sword on top of it. There are 2 other women in the painting reading but I decided to focus on Catherine in her frequently depicted marriage to Christ. This painting is part of a larger set known as The Seven Liberal Arts made for Federico da Montefeltro, Duke of Urbino (June 7, 1422-September 10, 1482). Justus of Ghent (Justus Van Ghent 1410-1480) was another Early Netherlandish painter who lived in Italy and was popular with the Italian nobility. Ghent was the Duke’s official court painter in the 1470s. Here we have the beautiful Rhetoric seated with a book and a man kneeling before her. 9. The Annunciation – Normandy, end of the 15th c., Musèe de Cluny, Paris. I don’t know much about this particular sculpture except that it caught my eye because it is stunning. The Virgin Mary once again depicted with a book receiving the news about her pending motherhood. It’s another one of my favorite sculptures for its detail and serene beauty. Beata Paola (Saint Paula, d. 1368) was a local saint from Tuscany. She was orphaned at an early age and take in by Camaldolese nuns. She eventually became a member of the order and was known for her teachings and becoming the patron Saint of Florence. This painting is part of a set of paintings known as the Littleton Saints. This panel with her holding a book was featured as part of an altarpiece for the monastery of Santa Maria deli Angeli, where she is buried under the high altar. This piece of a painting, featuring a nun holding a book, is part of a Predella from San Domenico Fiesole, Fra Angelico’s friary. Fra Angelico (1395 – February 18, 1455), born Guido di Pietro near Florence, was a Late Medieval, Early Renaissance painter. At age 22, he joined the Carmine Church and was already painting at that time. He was commissioned by important political figures like Cosimo de’ Medici (September 27, 1389-August 1, 1464), and several Popes, Eugenius IV (1383-February 23, 1447) and Nicholas V (November 15, 1397-March 24, 1455). He was beatified in 1982 by Pope John Paul II. This painting captured my attention because it was so odd. Saint Ottilia (Odile) of Alsace (662-720), a Benedictine nun, appears to be presenting Saint Christina (1150-July 24,1224) a set of googly eyes on top of a book. The image is bizarre. What’s really going on here? Saint Ottilia is known as the patron saint of eyesight. She was born blind and miraculously recovered her sight after being baptised. Lucas Cranach the Elder (1472-October 16, 1553) was a famous German Renaissance painter, printmaker and woodcut artist. He was purportedly a close friend of reformer, Martin Luther. 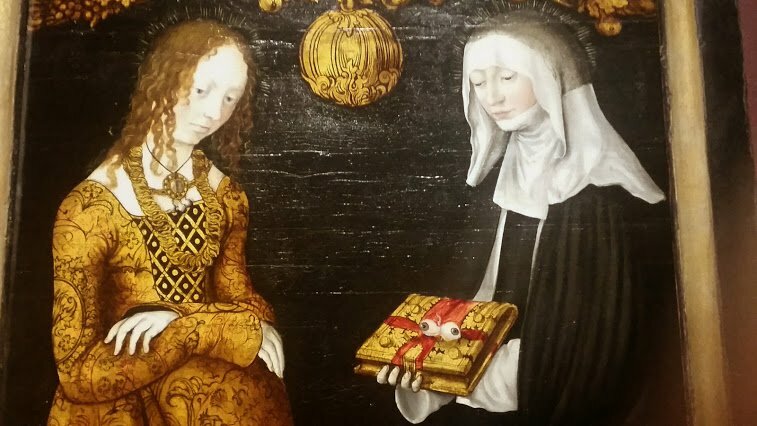 This strange painting at the National Gallery formed the outside shutters of an altarpiece for Frederick the Wise (January 17, 1463-May 5,1525). This beautiful and serene statue was one of the first things I saw when I walked into the Musèe de Cluny in Paris. Mary is often featured with books and there has been debate over whether she could read. Was it merely symbolic or a sign of growth in lay literacy? Sadly, the artist of this gorgeous statue remains unknown. This is a close up of an altarpiece made by Jacopo di Cione (1325-1390) and his contemporary, Niccolò di Pietro Gerini (1340-1414). It was most likely commissioned by the rivals of the Medici, the Albizzi family. This altarpiece, now at the National Gallery in London, was once part of the Church of San Pier Maggiore in Florence. Another beautiful image of a woman with a book. Unfortunately, I’m not sure which Saint she represents, but she is the only woman depicted with a book in this altarpiece. This touching painting of the Virgin Mary teaching Jesus to read was a private devotional painting made for Schedoni’s wife. Bartolomeo Schedoni (1578-1615) was an early Baroque, late Renaissance painter who hailed from Modena. Most of his masterpieces are in the Galleria Nazionale in Parma, Italy. This close up of Michelle de Vitry (1383-June 12,1456) comes from a massive painting in the medieval museum, Musèe de Cluny, in Paris. The painting depicts Jean Jouvenel (1360-1431), his wife Michelle, who is shown with an open book, her hands in prayer, and their 11 children. Jean Jouvenel was the Father of Jean Jouvenel II, a bishop and famous French chronicler and of the Battle of Agincourt. I love this statuette of Saint Margaret the Virgin holding a book. Margaret was a very young martyr; she died at the age of 15 in 304 AD. The daughter of a Pagan priest, she converted to Christianity under the guidance of a kindly nurse. Margaret was disowned by her father and went to live with her adoptive mother in Turkey. She rejected the Pagan Roman governor Olybrius’s marriage proposal and was tortured for her refusal. There are many miraculous legends surrounding Margaret; one being that she was swallowed by a dragon and escaped by irritating his insides with a cross! The dragon is seen here in this statue at her feet. Her Feast day is July 17th and she is considered the patron saint of pregnancy. Saint Barbara is the patron saint of armorers, miners, artillerymen and anyone who may face death by violent means. Why is she the patron of such a gruesome group? It’s due to the legend of her father being struck by lightening after beheading her for converting to Christianity. Her exact dates are unknown but she is usually dated to 267 AD. Her Feast Day is December 4th. This exquisite 16th century Mannerism piece depicting Mary Magdalen with a book is found in the National Gallery in London. The Master of 1518, sadly, remains shrouded in mystery. We know that he belongs to the anonymous Antwerp School of Mannerism, a mix of Italian and Flemish Mannerism often featuring ruins as a backdrop to the paintings. Unfortunately, a single artist cannot be pinned down. The Master of 1518 has been linked to several possible painters of the period. Here, Mary is holding a jar with Cain and Abel on it and the background is Provence, where legend has it that she spent the remainder of her life after the death of Jesus. A striking painting of the Virgin Mary sitting on a bench with an open book by her side. What’s really interesting about this painting is the intricate “painting within the painting” of the view outside her window. You can see in the top left corner an image of a city in amazing detail. This was a common feature of Early Netherlandish art. Robert Campin (1375-April 26, 1444) was one of the forefathers of Early Netherlandish and Flemish painting. He ran a workshop in Tournai and was the master of a painters guild.